In first part of this series, we did a high-level comparison between free versions of VMWare ESXi and Microsoft’s Hyper-V. 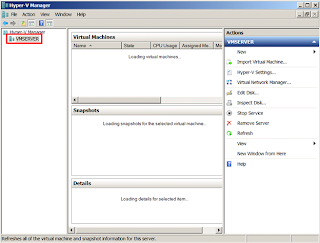 In this part, we will explore the insane (and absurd) challenge that exists when setting up Hyper-V to be a remotely managed, headless server. Finally, in the last part of the series, we will give you the essentials needed to start using Hyper-V and present the winner of our Geek Playground comparison. 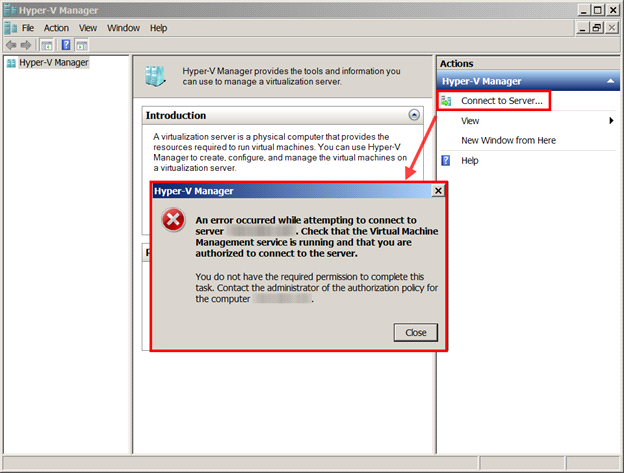 Hyper-V Server 2012 installation was smooth--maybe a little too smooth… There has to be a catch, right? Of course there is! The remote management setup is extremely frustrating and unpolished. In fact, I am a little surprised Microsoft released a product that has so many issues. All I want to do is connect to the server from my laptop and manage the VMs! Fortunately, since I had to struggle through the setup, I figured I would document the process to hopefully save you some sleepless nights. Here comes the ugly so hold on to your knickers! 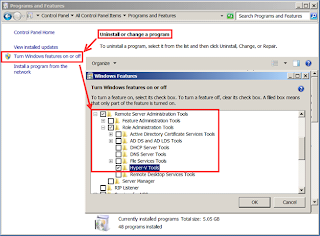 Caveat: “**Remote Server Administration Tools for Windows 7 with SP1 can be installed ONLY on computers that are running the Enterprise, Professional, or Ultimate editions of Windows 7 or Windows 7 with SP1. *” -- So no Home Edition… Sorry folks. Ironically, the Remote Server Administration Tools (RSAT) client took longer to install than the Hyper-V server. Crazy! 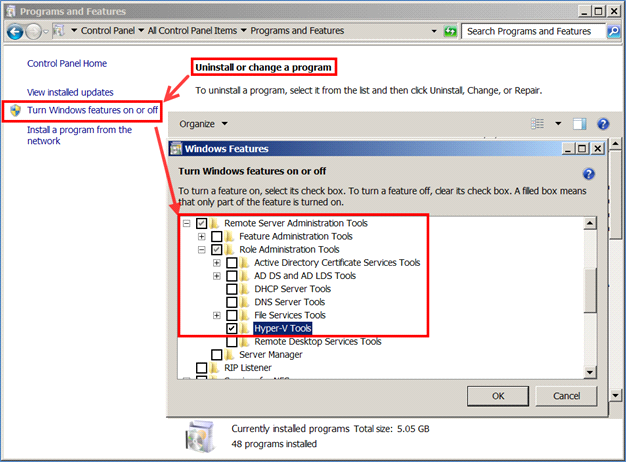 After Googling around, I found a series of posts by John Howard, a Senior Program Manager in the Hyper-V team. This series of posts included a very detailed, but lengthy, explanation on how to fix this issue. Not placing fault on John here, but in my opinion, maybe Microsoft should just fix the issue? It is hard to imagine that the product would be released with this frustrating limitation. 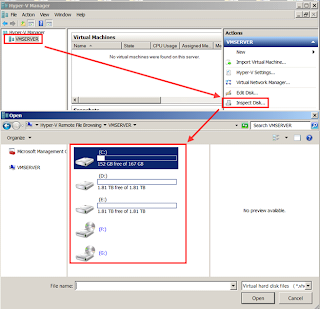 When using VMWare vSphere client, you just enter the IP/Hostname and some credentials--what is so difficult about that? 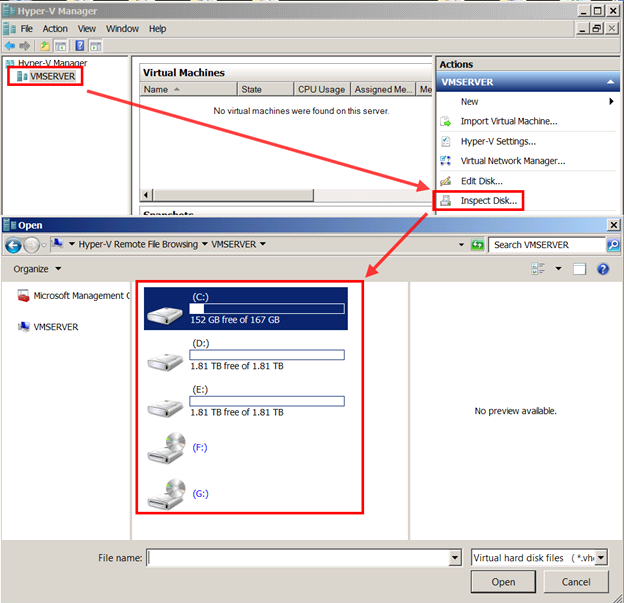 Now that we can access the Hyper-V server through Hyper-V Manager, we may need to make our extra disk drives in the server usable. Most people point and click via the GUI, but you can also manage the disks via the command line interface as well. CLI knowledge is critical for the free version of Hyper-V.
We have two extra hard drives (2x2TB) that do not show up as usable. We will fix that with Diskpart. DISK        - Display a list of disks. For example, LIST DISK. PARTITION   - Display a list of partitions on the selected disk. VOLUME      - Display a list of volumes. For example, LIST VOLUME. VDISK       - Displays a list of virtual disks. So, we have confirmed that my two DVD burners are D and E… I wanted to change that to F and G and then assign drive letters D and E to my other hard drives. Wow, that was painful. And we did not even do the hard work. Fortunately, John Howard did the heavy lifting and then made things relatively easy with his awesome script. I still cannot believe Microsoft would release a product that requires that much configuration for something that should be so simple. Stay tuned for our next article on actually using Microsoft’s Hyper-V and of course the conclusion of our comparison between VMWare ESXi and Hyper-V 2012. Tony, I really appreciate these articles. I have been struggling with various environments. Gonna give this a shot! Keep the great blogs coming. So many options... so little weekend. Thanks for the feedback! I think the reason your having all these security issues is because your not on a domain. Most likely i think your probably on a workgroup. If you were on a domain everything would be seamless. Microsoft of course is not going to spend much effort for those that don't represent a big enterprise customer which will be on a domain. So is it a big oversight? For those customers that matter (big enterprise customers) definitely no. I think you are right about not being in a domain--however, what is refreshing is that I am not the only weekend nerd warrior who has run into this issue. The feedback has been great. Maybe if the collective peons make enough noise a change will come about? (crosses fingers) Thanks again. I agree with above, if you joined this Hyper-V server to a domain and used a domain account, all of these issues would go away. In fact, you could even run your RSAT tools from a workgroup machine with your domain creds, and that would work too. Stephen and Anonymous, those issues do not go away when on a domain. 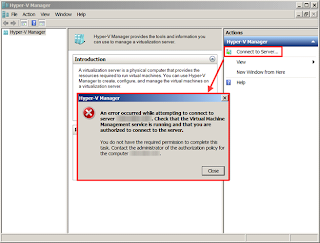 Hyper-V Manager on Windows 7 still has issues. 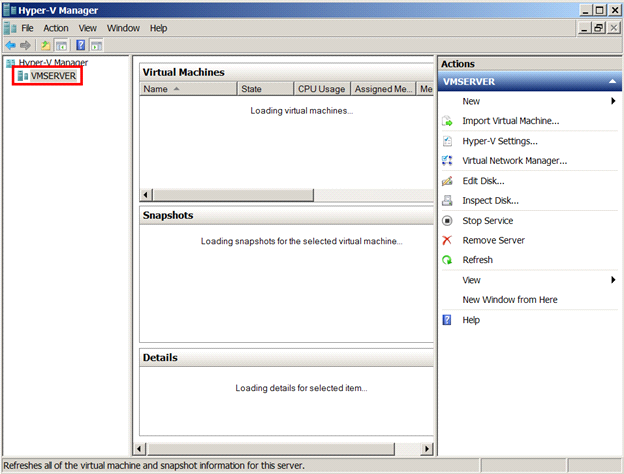 A Server 2012 with Hyper-V can easily see another Server 2012 running Hyper-V with VM's. The issues only go away if everyone is on Server 2012.